Are you going camping or bugging out? Does it involve hiking and sleeping out in the woods? Well, it does include considering a bag that will be convenient enough for you during your escapades. One of the mistakes you can do is traveling with a stressful backpack. For this reason, it is beneficial for you to consider the different bug-out bags available for your journey. A bug-out can be an asset as well as a liability if not carefully selected. Below are some pointers to help you pick out the right bag for you. A bug-out bag needs to be comfortable. Depending on what the bag is for, comfort is one aspect of it you can’t compromise. The bag needs to be something that you can easily carry without hurting your shoulders. Why bug-out with a bag that is any more of a burden than it has to be during an emergency evacuation when a disaster strikes? The padding and straps are a great way to confirm if the bag is comfortable or not. The belt that is close to your hip is the most important piece since it is the one that allows the bag weight to rest on the hips. It should be much stronger than the one designed for the shoulders. The straps of the bag should contain the right measurements for your body weight. You need a bag that does not have any rigid frames. Also, find a bag that has no metal frames near the head. You risk hurting your head especially if you slip and fall with your back. One of the crucial aspects of a bag is the size. What is the bug-out bag for? If the primary purpose of it is for carrying more items, then you should consider a more significant option. However, if it is mainly for moving lightweight stuff like the FAST-ACT Decon Mitt which contains a containment system when you are in a position where there are chemical spills, then you don’t need a large bag. Sometimes, you may need the bag to carry out a few first aid necessities, therefore, when shopping for a bag, consider the number of items you intend to carry. Note: avoid carrying excess things because they make your bag heavy, minimizing your mobility. 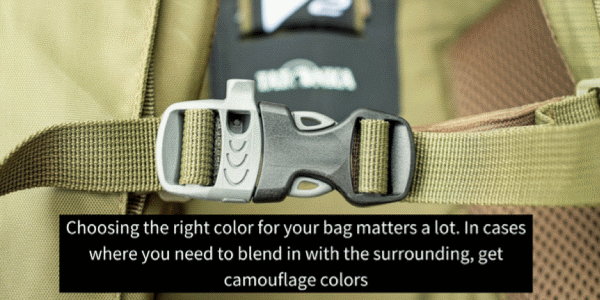 Choosing the right color for your bag matters a lot. In cases where you need to blend in with the surrounding, get camouflage colors. If the bag is for hiking purposes, choose a neutral color that will blend in with the environment like brown, green and so on. The reason for such neutral colors is to avoid unnecessary attention. You don’t want to attract animals or unwanted visitors with your bag’s colors. I use the can of Coke analogy. That bright red color is what attracts bees close enough to get the sugar scent that makes them stop by for a drink. Put a can of open Coke on one end of a picnic table and a second open Coke, but in a dull colored koozi on the other and see for yourself. Whether you need to buy a bag with a frame or not depends solely on you but, it’s highly recommended to purchase a framed bag. The reason? This helps in balancing the bag against your body weight. On average, filled, it should not weigh more than 20% of your body. This translates to about up to 40 lbs. 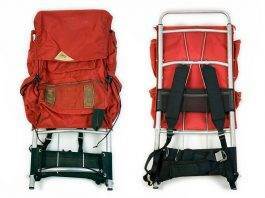 A bag that has frames will help in weight distribution which in turn reduces pressure on your shoulders. Bags that have an external frame are designed to hold heavier items. They also give you a chance to carry sleeping bags when you have decided to go hiking with your friends up the mountains or, well, bug out! Internally framed bags are also helpful because they make the bag more stable and lighter. This, in turn, helps in mobility for those who are looking for such a bag. A frameless bag will in the long run cause back pains which could result in a long-term problem. Of course the final weight of the bag will depend on how much supplies you are carrying as well as the number of people who you intend to support with them. 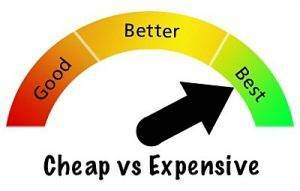 Cheap is for now, but expensive is forever. Do you want a cheap bag or one that will serve you for the longest time? The choice is yours though the trick is investing in a bag that will last almost a lifetime. Consider a bag that will withstand intense conditions regardless of the environment. Purchase a bag equipped with quality material. To find a bag that has higher chances of lasting long, you can check on reviews of the specific bag and see what other people think about it. Additionally, find one designed for survival. A secret towards successfully purchasing a bug-out bag is one that has compartments. How stressful is it to keep searching for items that are all packed in one place? This can also become time-consuming. The bag should have a significant compartment for carrying larger items while other smaller compartments of different sizes for varied items. These little items could include the FAST-ACT Microfiber Towel Pack which contains the FAST-ACT Powder Bottle Pack for decontamination purposes. Compartments are a great way of organizing your bag to trace items easily, especially during extreme emergencies. If possible, find one with compartments that can be closed to avoid dropping out some things. Find a bug-out bag that will keep you aerated. Walking miles and miles will eventually cause excessive sweating. Get a bag that has enough space which is designed to allow adequate air to flow. This because the sweating creates a lot of discomforts hence the need for such a bag. Most bags will come with a rain cover in cases of rain. They will ensure that your items are safe and there are no chances of soaking in the rain. There are bags designed for males and females. If you prefer one that is of a specific gender, then consider the strap size as well as the shape of the bag which is the most crucial. However, you may want to go with a bag that is universally designed with no gender in mind. Whatever you decide, make your choice worthwhile. Put into consideration that the bag you choose will affect you long term. 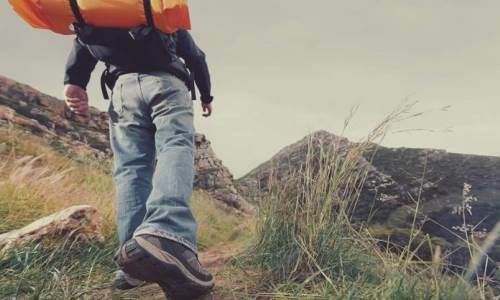 The bug-out bag is a great move towards your disaster preparedness journey. The wide selection of bags is there for you to decide what you are comfortable with. Put into consideration the above points for successfully picking out a bag that will increase your chances of bugging out during emergencies.